The book is written by the same person who blogs at A Bowl Full of Lemons. I reached out to Toni and asked if I could share a few photos of the inside of the book, to which she graciously said yes. 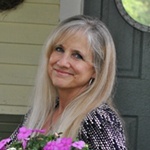 Toni has a fabulous blog – be sure to visit her! The book is divided into weeks, instead of chapters. So the idea is that your home (and even your car) can become organized within 15 weeks. Each week is further divided into numbered tips, making it easy to read and follow. I was surprised at the beautiful photos of rooms and vignettes. I wasn’t expecting to see such pretty photos in a book about home organization (which is part of why I fell in love with it). When I saw this bathroom sink, it reminded me of my upstairs bathroom. I felt like it was a sign that I was supposed to buy the book. When you live in an old house like mine, you don’t have a lot of storage options. So it’s nice to see a book that provides solutions for charming old homes that have very few closets. I’ve already gained lots of great organizational tips. And the book is enjoyable to read and browse through since it’s filled with plenty of eye candy, too. I’ve added it to a stack of some of my favorite books. It may take me longer than 15 weeks to get organized, but I’ve definitely gotten started! 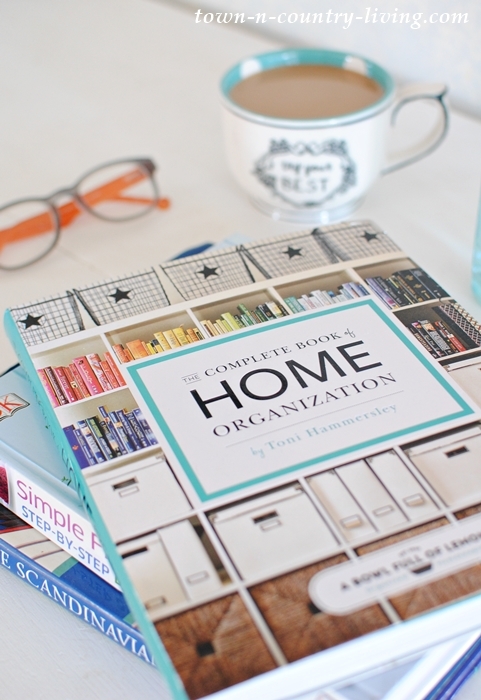 If you’d like to enter to win a free copy of The Complete Book of Home Organization, just leave a comment below telling me you want to enter. If you can’t wait to win a copy, you can purchase the book on Amazon. The winner will be announced next Saturday, February 11th. Good Luck!! Many thanks for the chance to win the Orfanization book! Believe me. organizing is what some of our rooms need! Thanks again. My house is so disorganized since I had my one year old – there is clutter all around and it’s driving me CRAZY (is there anything in the book about organizing toys?) – I would love to win this book!! ???? I would like to enter the book contest. I would love nothing more than to win a copy of this book. I have looked at it several times, but unfortunately I never have the “spare change” needed to buy it. I have inherited 6 households full of antiques and things I know are expensive, I just don’t know how to decorate with them. This book would really help me learn to combine the items from the 1800-2013. Thank you so much for the opportunity to win!!! I would love a copy. I am constantly organizing, which is fun for a while, then is endless and frustrating. I could really use help. 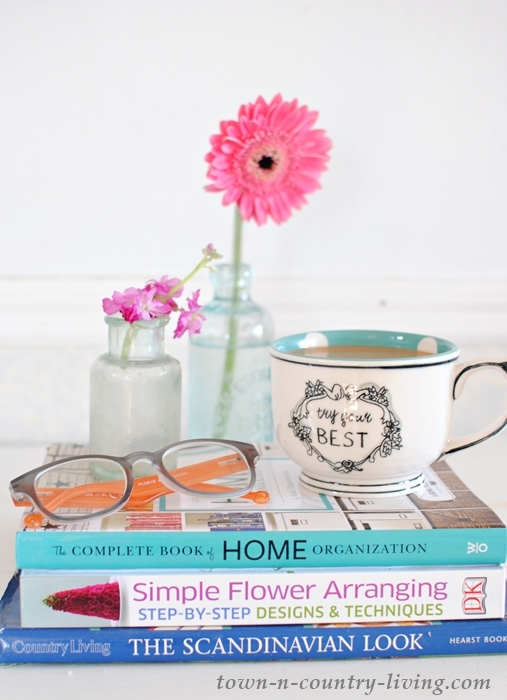 I would love to win this book on home organization. I could use some organization in my life right now. I would love to have a copy of Toni’s book. Please enter me in the drawing. Thanks! Sure would like to Win 🙂 I’m living in older small house. It feels like I should have closets in every wall but I don’t want to. Please enter me in the drawing for Toni’s book. It looks beautiful and creative. Boy, I could really use some help organizing. I have limited space to store things so I could use her insight on how to get the most out of the space I currently have. Thank you. I have just moved to a slightly smaller apartment and need to get rid of some clutter. And to get organized at the same time would be perfect! 🙂 So I would love to win this book if it can be sent to Norway. Help! I need help to de-clutter & organize my home! I would love to win because I just moved into a house built in 1913. It is a beautiful home but I need ideas, organizational tiips and just ways to do things and also keep it updated on a yearly basis. I have RA, Fibro, Lupus and some other medical problems and I REALLY need a way to stay organized and updated by not putting me in too much stress all the time. Good luck to all and God Bless each of you! It looks like an amazing book. 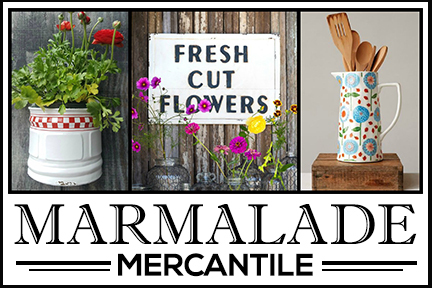 I would love to be entered in your gracious giveaway! What a gorgeous and practical book! 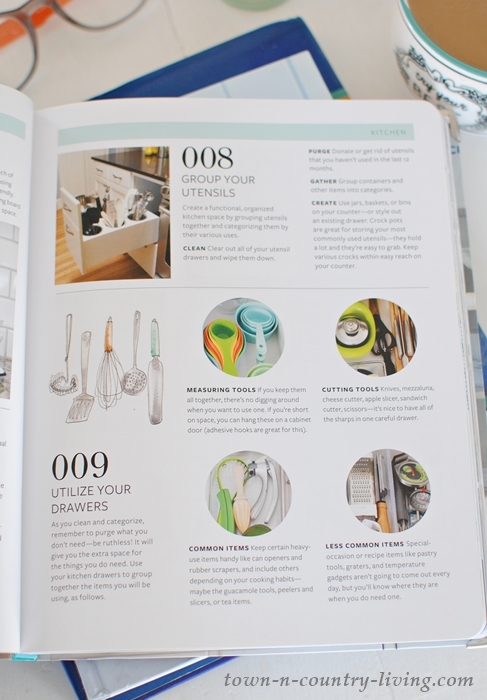 Would love to a copy so I can achieve optimal home organization. Thank you kindly! Id like to enter my name into this awesome giveaway (thank you Town and Country Living and Bowl Full of Lemons)! I am a creative, and like many in that arena, organization is something I have to work hard at. I’ve made a lot of strides over the years, but definitely could use this book to help me even more. It looks like it is not only very helpful, but also very pretty to look at. Oh wow, what a neat book! I’m living in and remodeling a 1930’s home and the lack of closets is a real thing. ???? If I don’t happen to win this book, I may just have to order it as a Valentine’s gift for myself. ???? Well, I guess you should count me in. This morning my husband forwarded an email to me about clearing away clutter in our home. Enough said. looks just what I need to help me in this matter. I would love to be included. I’d like to win! We moved into our home 2 years ago and immediately started the renovations. I’m looking forward to the day when there will be a place for everything and I think this book will help me with visualizing it! THANKS! Pretty! I love tips on better organization. Wow! Yes, I would love to enter! I need this!!! I would like to enter. Thank you. Thanks for sharing and sign me up please! I can use all the organized tips I can get! I would like to be entered to win this book, thanks for the opportunity! I so would love to win this book. We recently became empty nesters and a whole lot of purging needs to be done. Now I am trying to live in a darling 1492 sq. foot apartment!!! Can you even imagine that!!! I won’t go into the details but so far it’s not a pretty sight. So you can see, I really NEED this book! Please enter me in the book giveaway. I’ve lived alone in my house for nearly 25 years and while I think I’ve done a good job of staying organized – my sisters make fun of me for the containers and labels in my pantry – I’ve started updating, in some manner even if just paint, nearly every room of my home. My problem is keeping (and organizing) way too much stuff. I need a kick in the pants to get me to do the “keep/donate/throw away phase of organizing and hopefully this book will do just that. Thanks to you and the author for offering it. I am a bookaholic and if you could see my house, you’d understand why I so desperately need this gorgeous book. Please, please, consider my plight snd help me to regain sanity!! A Long Time Follower in Need of Help! I would certainly love to win this book! I am retired and two years ago my daughter moved back home due to some unfortunate events. My son has gone back to university to finish his degree and is also living with me at this time. So that means extra furniture and STUFF!!! Seems like every corner has STUFF! Some organizing ideas would be greatly appreciated !!! I would love to win this book! I need all the help I can get when it comes to organizing my home. Thanks for the chance to win! My kids have moved out and I want to make a craft room. This would be so helpful in helping me set it up. I would love to win this book. I NEED it! I would love to have this book. I am trying to organize and purge. Thank you for the chance to win! Yes, please enter me in the book giveaway. Sounds like some great projects to work on. I totally agree it’s a fantastic book!ive had for a few months now and I have to be honest, I haven’t done anything with it yet (busy lives etc!). Although I have been slowly reorganising parts of my house and life, this is a timely reminder. Reading your post this morning has rekindled my interest so I will dust off my book and re-read it over a good cup of coffee. Good luck to all the other participants and I wish the winner joy with her new book. Yes I would like to enter to win the book. I tried to order the book from amazon but I live in Greece and I cant. ???????????? Please enter me! 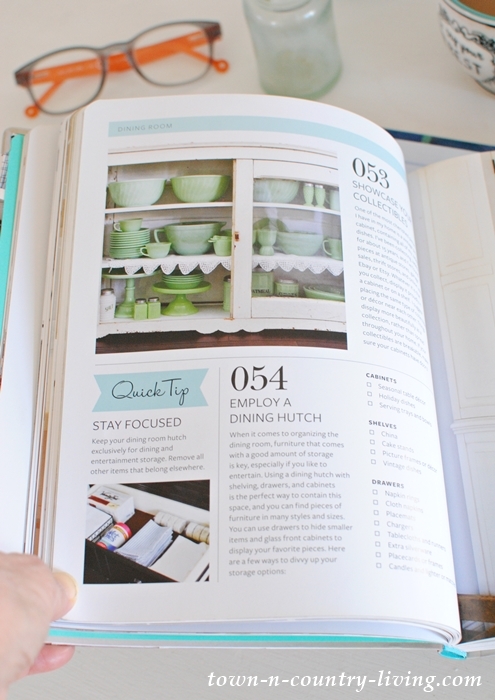 I love the book and would love to get organized in my home. I have so much clutter, and I think if I can organize things I would be able to know where everything is. Thank you for such a nice giveaway opportunity! It looks amazing. Yes, I would love to win the book. Thank you. I’d love to win. I’m a little organizationally challenged! I’d love to win this book, I’m not the best at organizing a house and this seems like it would really help me out. Looks like both a practical as well as beautiful book. She always has great ideas! Oh goodness, I NEED this book! My home is an old log cabin, about 700 square feet and with very little storage of any kind. Combine that with a book lover, vintage collector, several pets and no time to do anything, and you have a mess!! This is my year of purge, so I NEED this book! I most definitely would love to win this book. I’m working on minimalism and organization every day and would love this as a guide. I’ll give it a try and most definitely tell my friends all about the process as I go, too! Looks like the amazing photos are exactly the kind of motivation I would need to keep me going, too. The author of this book probably had someone like me in mind when she wrote it! This is definitely my year! It’s been a process for sure. Thank you for the chance to win this awesome book. Love your blog! I would love to win this book. I’ve always been drawn to the cover photo and the photos from inside the book that you have shown us are just as beautiful. 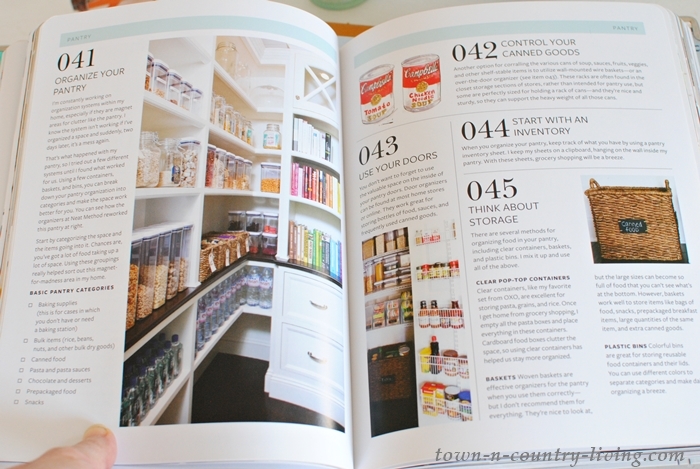 That pantry looks amazing. Thanks for the great contest. I would love to win this book. I’ve always been drawn to the cover photo and the other pictures you have shown us are just as beautiful. That pantry is amazing. Thanks for the great contest. What a fantastic giveaway…would love to win this book. The simple, clean layout is so inspiring! I have heard great things about this book and would love to have a copy of my own! I would love to win this book. Living in an apartment always leads me to trying to find clever ways to store and organize all of our things. better place. Such a beautiful book, with practical advice. Thanks. I’d love to enter to win the book! This is the first of hearing about this book and I love it! Want it! Sounds great!! Oh yes, please. What a beautiful book. Thanks for the chance to win! Looks like a great book! I’d love to win it! Thanks! I would love to have this book! 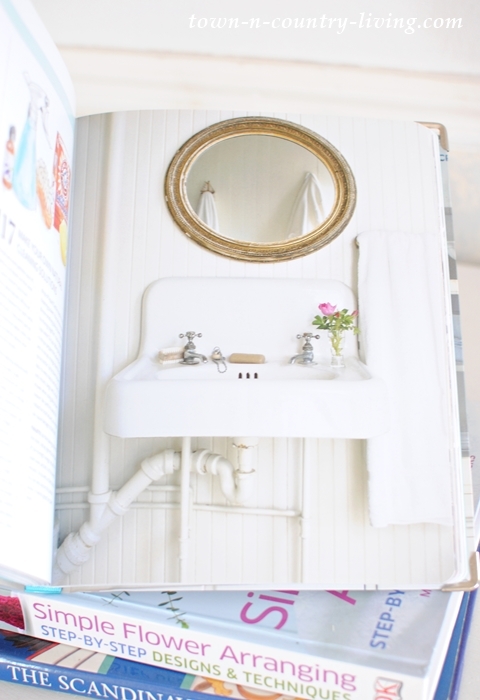 I grew up in a big 12 room Victorian style farmhouse and we had that exact sink in the only bathroom! People voice negative opinions when I replaced builder grade sink/cabinets with pedestal sinks. “Well you won’t have any storage!” I traded ugly storage for style! Adoro decoração e organização, quero muito ganhar este livro, sei que irá me ajudar muito com dicas e informações. Moro em um apartamento pequeno e qualquer ajuda para organizar e otimizar espaço faz toda a diferença. Além do mais irei indicar a leitura do livro para outras pessoas. Aguardando ansiosa para ganha-lo. Jennifer, I would love to have this book. My husband and I will be retiring within the next few years and I need to begin downsizing. I am very hopeful that as I begin culling away items which won’t be with us in our next move that I learn to organize the things that we will be taking with us. This is a beautiful book. It’s on my wish list at my favourite book store. What a joy it would be to win it. We are downsizing from a large home to a much smaller one at the end of this month (we are empty nesters) and I’ve got lots of organizing to do when we settle there. Thank you for the opportunity. And good luck to all! Looks like a great book. The weekly assignments to be completed in 15 weeks sound like a doable plan. 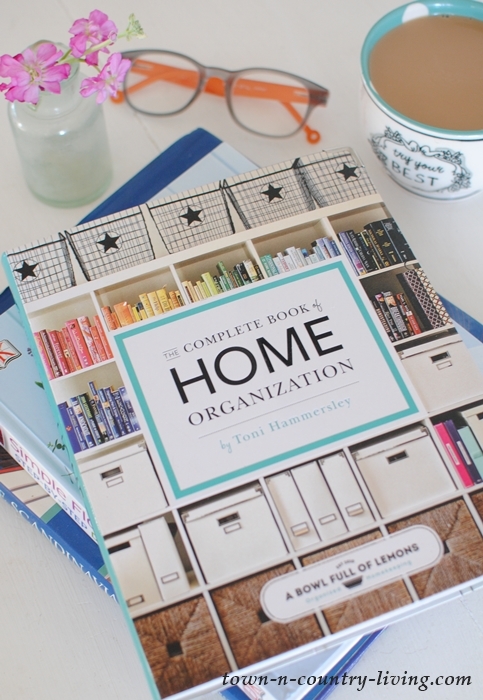 Would love to win this insightful book to help me get better organized. I’d love to win this book. I’m always looking for ways to organize my home. I would la la LOVE to win this book! Looks amazing and super helpful! Cheers! I would love to win this book. I have two young children and work full time. Trying to stay organized is a daily challenge in our house! The timing for this book couldn’t be better. I’m recovering from hand surgery and there is little I can actually do for myself right now. 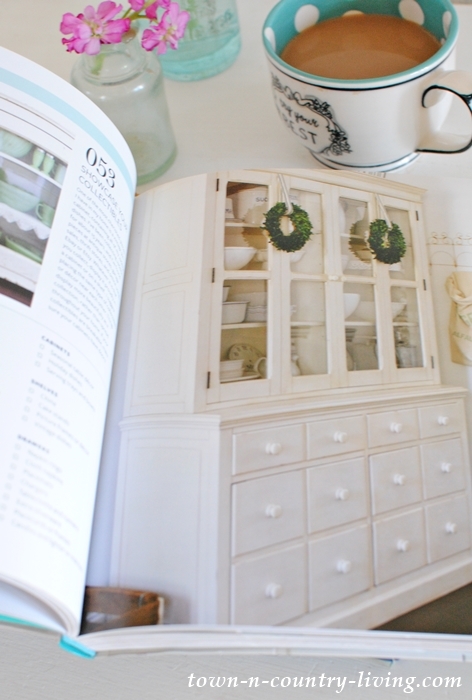 I’m obsessed with scanning blogs that provide direction for organizing and restyling our home. Kind of gives me ideas and motivation for completing physical therapy. I would love to read this book. Thanks for the opportunity….loving your blog. Good luck everyone! Jennifer I would love to win this book! My husband and I will soon be moving from the 2000 square foot home we raised our four children in to a 1600 square foot home that we have been remodeling for the last 2 years. We have been in our present home for 43 years so there is sooooo much organizing to be done. I would love to organize as I pack things up, give away treasures to children and grandchildren and charity. I think this will be the perfect time to pare down all my 51 married years of collecting treasures and only move in what I can really organize and keep organized. The “keeping organized” is the problem area and the book looks like it would provide a whole lot of useful information to this “new” organized lifestyle. Thank you for the opportunity to win this book. Please enter me into the drawing. Ooooo! I would LOVE to win this book! I really need to organize. I have a big house and we will be downsizing soon. Need to know how to maximize my organizing. I know if I don’t I will be getting rid of too many things that I still love!! I would love to win this book. 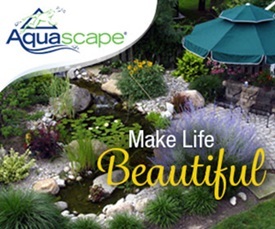 Your site is so beautiful. Please enter me for this book. This is my #1 goal for 2017! I want to organize and declutter my house. I would love to win this book! We too live in an old apartment with barely any closets for storage. I keep wanting to throw things out just because I have no place for them, but always end up keeping stuff because at the end of every organizing attempt, I would realize that we don’t really have too much stuff, just no real place to store them. This book is really pretty. Would be nice and helpful to have my own copy! I’m one of those people who won’t allow myself to play (do my scrapbooking and hobbies) until my work ( organizing my home) is done. Therefore it has been many, many years since I have played! I’m just so overwhelmed by the amount of work to do; I can’t get going. Where do I begin? It looks so informative! !Great ideas! 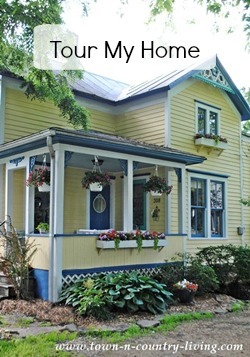 I would like to win this book on home organization. My daughter could really use this! While always interested in how to manage my life better to reduce stress and re-work, I just moved to southern California into a small house. Now I really need help to organize each area a I unpack. The book looks amazing and I so need it right now…. I would love to have this book! Thanks for the opportunity! I live in a small and old apartment with very limited storage so I am left putting things on top of every table I see. I can’t even organize my stuff because I really don’t have the talent . Many times I’ve attempted to “organize” to de-clutter but end up messing things up all the more because I can’t find the things I need when I have to use them. I really need a lot of help from the pros and I BELIEVE that this book will do just the way I like it and transform my apartment into a more wonderful place to live in. So PLEEAAASE, do me a favor…. let me have this book. I just don’t want it but I NEED IT. Thank you.